Villagers briefly returned home Tuesday to check their farms along the fertile slopes of an Indonesian volcano that erupted after laying dormant for more than four centuries - catching many scientists off-guard. Betta Tarigan, a 48-year-old farmer, piled into the back of a crowded pickup truck and headed up Mount Sinabung early Tuesday for a look at his cattle and crops before heading quickly back to one of many emergency shelters along the volcano's base. White smoke poured from the mouth of the crater and the air was thick with the smell of sulfur. "There's not going to be a harvest this year ... just look at these tomatoes," Tarigan said sadly, pointing to fields covered in gray soot. "They are all going to die." The eruption of the 8,000-foot volcano on Sunday was followed by a much more powerful blast Monday, forcing the evacuation of more than 30,000 people and putting the region on the highest alert level. Some domestic flights had to be diverted because of poor visibility. Two people died, but Priyadi Kardono of the National Disaster Management Agency said it was too early to say if the volcano was to blame. Sinabung last erupted in 1600, and officials acknowledged they had not been monitoring the volcano because it had been inactive for so long - meaning they know next to nothing about its eruption patterns. "We were totally in the dark," said Imam Simulingga, a government vulcanologist, noting that there are 129 active volcanoes in Indonesia, which is located within the so-called "Ring of Fire" - a series of fault lines stretching from the Western Hemisphere through Japan and Southeast Asia. "We didn't know anything until it started rumbling." He and others said they would be watching it "very closely" from now on. Like other volcanoes along the Sumatra fault line - the meeting point of the Eurasian and Pacific tectonic plates that have pushed against each other for millions of years - Sinabung has the potential to be very destructive. Magma forming inside the conical tip can act as a plug, allowing pressure to build up until it reaches a bursting point. "A volcano with a long repose period could deliver a more powerful eruption," as was the case with Mount Pinatubo in the Philippines in 1991, which killed about 800 people, said Alain Bernard, a professor at the University of Brussels. 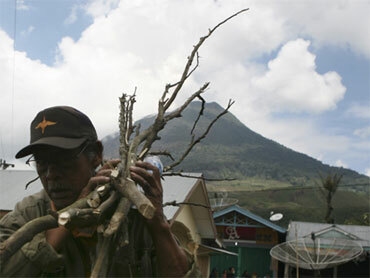 Sinabung could either go back to sleep or produce a series of blasts with increasing intensity, he said. "A Pinatubo-size eruption is a rare event and unlikely to appear during the following days," Bernard said. "It takes normally weeks or months." The number of people evacuated to emergency shelters, mosques and churches has reached more than 30,000, many of them wearing respiratory masks, said Erni Damanik with the Tanah Karo district information center. Although strong wind shifts or a powerful follow-up blast could affect air traffic in nearby Singapore and Malaysia, Transportation Ministry spokesman Bambang Ervan said only four domestic flights heading to the provincial capital of Medan were diverted so far. The Eyjafjallajokul volcano in Iceland erupted April 14 and disrupted international flights for days. Pall Einarsson, geophysicist at the University of Iceland, said he saw no connection between that eruption and the one in Indonesia on Sunday. Indonesia is home to some of the largest eruptions in recorded history. The 1815 explosion of Mount Tambora buried the inhabitants of Sumbawa Island under searing ash, gas and rock, killing an estimated 88,000 people. The 1883 eruption of Krakatoa could be heard 2,000 miles away and blackened skies region-wide for months. At least 36,000 people were killed in the blast and the tsunami that followed.